Rare complete strap watch from the 70's with a large ivory epoxy disc front. Round case with fluted bezel and black dial. Pumping crown integrated in the clipped back (signed and numbered). Large brushed steel strap, covered with leather and integrated into the case. Movement: Mechanical manual winding Caliber France / FE 68. Original design watch from the 1970s, chrome-plated with rectangular "H" shaped case, round fluted bezel with engraved hour indexes. White parchment dial, black spatula hands, integrated winding crown and clipped back (signed and numbered). Lanvin strap in black leather vynil. Movement: mechanical manual winding caliber France/ FE 68. 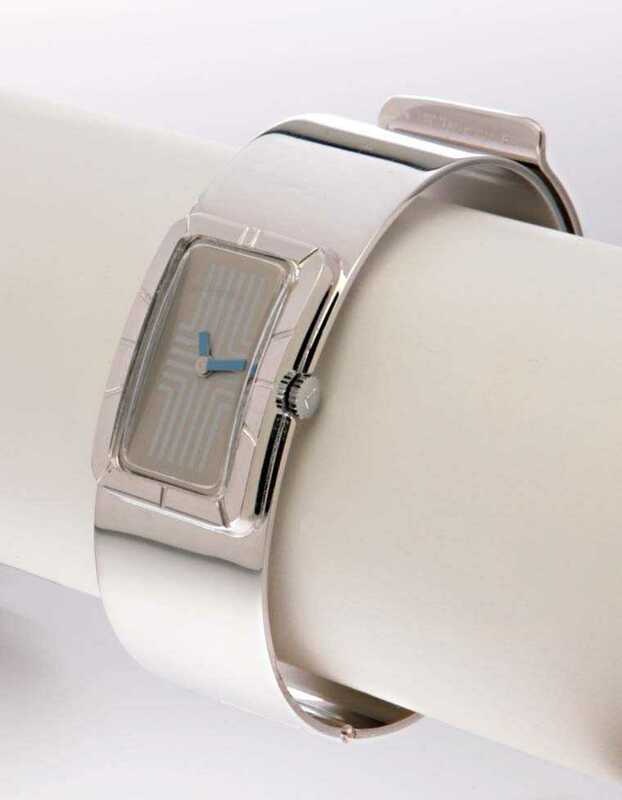 Original design watch from the 1970s, chrome-plated with rectangular "H" shaped case, round fluted bezel with engraved hour indexes. Matt black dial, white spatula hands, integrated winding crown and clipped back (signed and numbered). Lanvin strap in ivory white vinyl leather. Movement: mechanical manual winding caliber France/ FE 68. 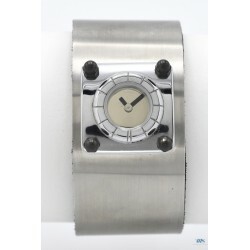 Rare watch “full wristband“, design from 70’s in brushed steel and chromed bezel with 4 stylized screws. Round case with fluted bezel and chromed mirror dial. Integrated crown and clipped back (signed and numbered). 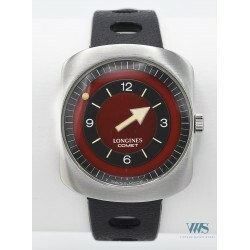 Large brushed steel strap, leather-wrapped inside and integrated in the case. Movement: mechanical manual winding caliber France / FE. Funny alarm clock for older children in molded plastic and alloy back. 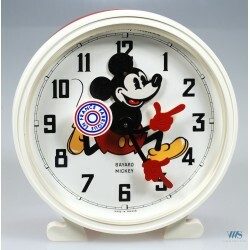 White dial with Arabic numerals and design of the Walt Disney character, Mickey. The head moves and serves as second hand, arms serve as hands for minutes and hours. Note the base of the Alarm clock in the shape of feet. Movement: mechanical manual winding caliber France. Funny alarm clock in red metal molded surmounted by two bells. 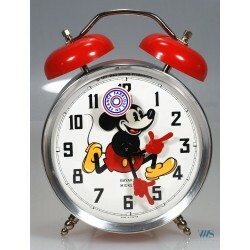 White dial with Arabic numerals and design of the Walt Disney character, Mickey. The head moves and serves as second hand, arms serve as hands for minutes and hours. Movement: mechanical manual winding caliber France. 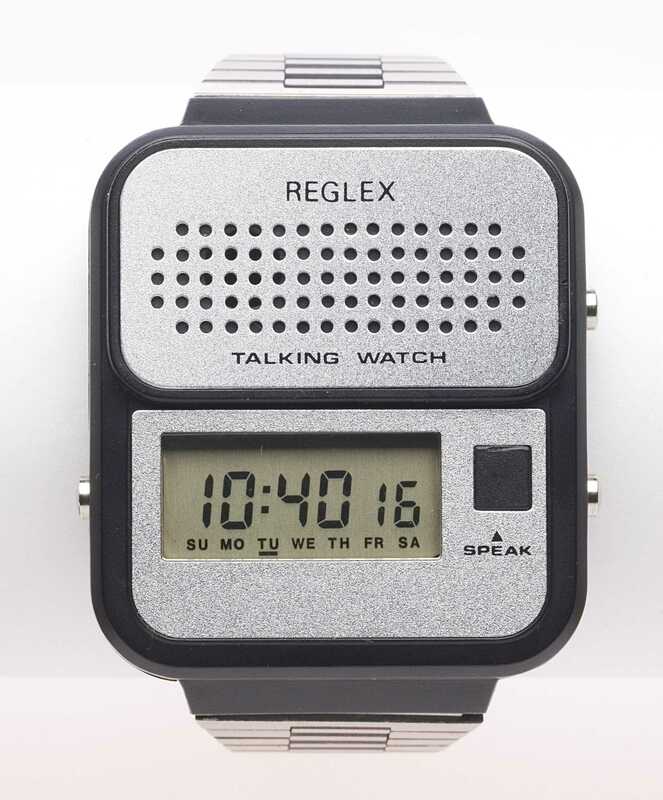 Original analog rectangular "talking" watch in plastic and alloy, clipped-back. Analog reading, hours and date in the bottom window (setting by push-buttons on the left and right). Black button activates voice reading (in English). Brushed steel strap original. Note: This watch appears page 201 of the reference book "Watch, history of the modern wrist watch" Movement: Quartz caliber Sharp four batteries / Japan. Rare watch 'full strap' design 70, wide chrome front disc in wood. Round case with fluted bezel and black dial. Crown integrated in the back and bottom of case clipped. Large brushed steel bracelet, leather-wrapped and integrated into the case.Movement: mechanical with manual winding caliber France / FE 68. 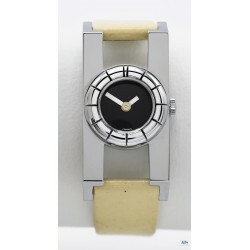 Original watch "ingot shape" design 70 in Plexiglas (signed and numbered). Round case with fluted bezel gold-plated, gold dial mirror. Integrated crown and caseback clipped gold plated. Original leather strap signed.Movement: mechanical with manual winding caliber France / FE 68. Original watch 'flying saucer' design 70 in Plexiglas (signed and numbered). Round case with fluted bezel gold plated and gold dial mirror. Integrated crown and caseback clipped gold plated. Original leather strap signed.Movement: mechanical with manual winding caliber France / FE 68. 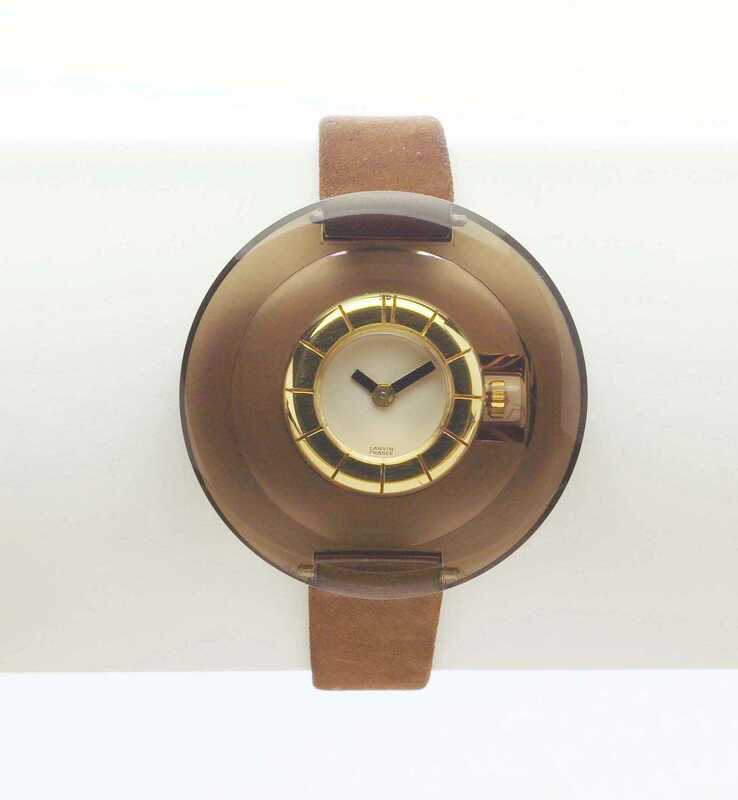 Rare and original watch design gold plated, style 'wristband' 70 (signed and numbered). 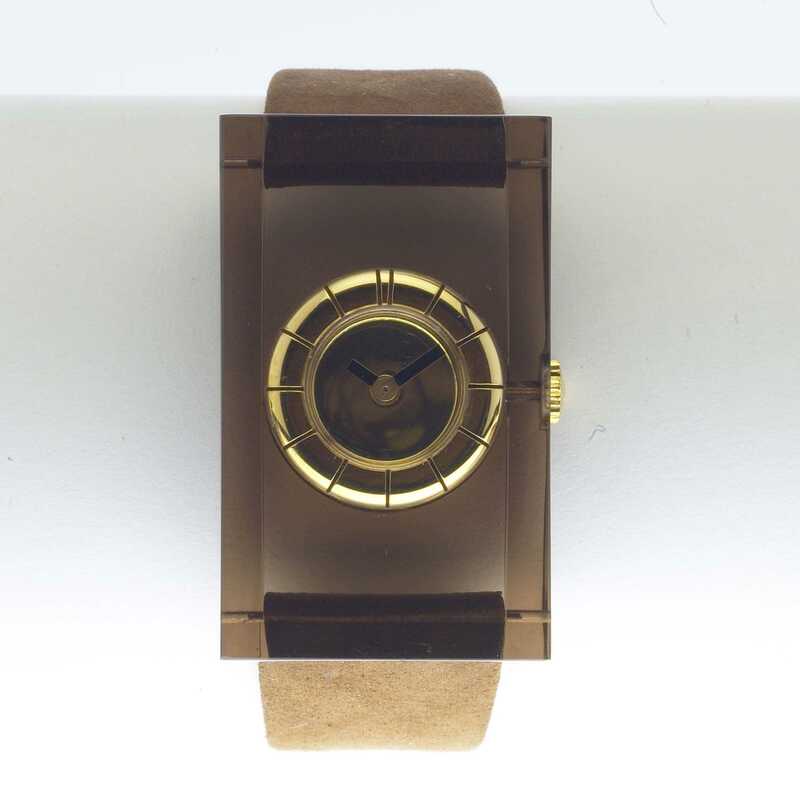 Rectangular case with fluted bezel and gold dial with a stylized cross. Integrated crown at 3 o'clock and caseback clipped. Wide bracelet yellow gold plated, cut to integrate the watch and bracelet closing system. Hands stylized, blackened steel.Movement: mechanical with manual winding caliber France / FE 68. 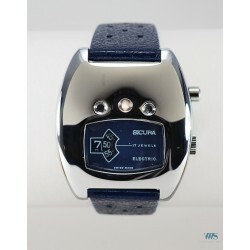 Rare and original watch, rectangular 'wristband' Design 70 chromed (signed and numbered). Rectangular case fluted bezel and silver dial monogrammed mirror. Integrated crown and caseback clipped. Large chrome strap cut to include the locking system of the bracelet. Hands turquoise.Movement: mechanical with manual winding caliber France / FE 68. 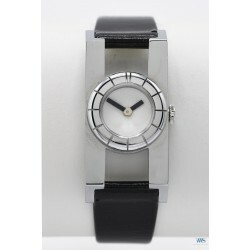 Rare watch 'full strap' design 70, wide chrome front disc in black epoxy. Round case with fluted bezel and white dial. Crown integrated in the back and bottom of case clipped. Large brushed steel bracelet, leather-wrapped and integrated into the case.Movement: mechanical with manual winding caliber France / FE 68.